Sundar Ganapathy has over a decade of experience advising some of the largest healthcare, retail and telecom companies on driving sustainable growth through digital marketing strategy and the adoption of agile operating principles. He is recognized as a “full stack marketer” adept at leading organizations and coaching executives to harness the power of data science, experience design and marketing technology to drive customer acquisition and retention. Across his career, Sundar has helped companies navigate the intersection of marketing, data and technology to maintain their competitive edge. Sundar has advised on topics including online to offline attribution, segmentation, qualitative & quantitative market research, predictive lead scoring, multivariate creative testing, cross device measurement, media optimization, earned media amplification and the effective activation of first party and third party data in regulated industries. 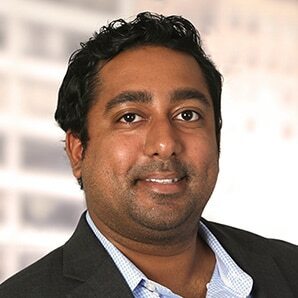 Before joining McKinsey & Company, Sundar was launching and leading a marketing analytics and media buying practice at Trendline Interactive, a digital marketing agency headquartered in Austin, Texas. Prior to that, he led the media analytics and data strategy practice at the New York office of OMD, an Omnicom Group subsidiary and one of the largest global media agencies. Sundar has previously held a leadership role at Carat, a Dentsu-Aegis media agency. Sundar holds a B.S. in Marketing and Finance from the Leonard N. Stern School of Business at NYU.